This Boost Mobile store, just three doors from the Uptown alderman's office, was robbed at gunpoint Thursday..
Armed robbers forced an Uptown cellular store employee into a back room at gunpoint during a hold-up on Thursday afternoon. The case bears strong similarities to the robbery of a Lakeview Metro PCS on Saturday. 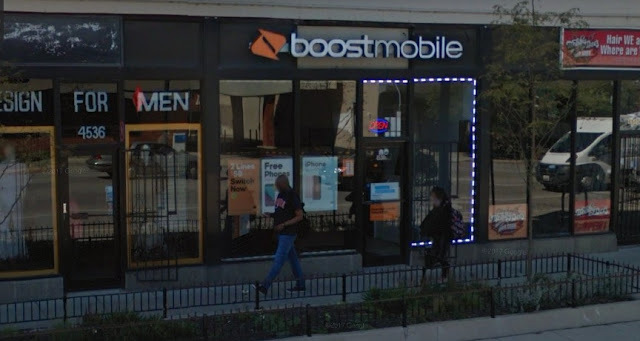 Thursday’s robbery took place at Boost Mobile, 4538 North Broadway, just three doors down from Uptown Alderman James Cappleman’s office. Shortly after 4 p.m., two men entered the store and one of them pulled out a handgun. Police said the armed man forced a worker into a back office at gunpoint while the second man cleaned out the cash register and collected eight or ten new phones. The duo then fled the scene in an unknown direction. The gunman was described by police as a black male who wore an “old school” New England Patriots baseball cap, a puffy black down coat, blue jeans, and black work boots. His accomplice was said to be a black male with facial hair who wore a red and white skull cap, a gray hoodie, blue jeans, and blue gym shoes with white soles. On Saturday evening, two men robbed the Metro PCS at 3961 North Ashland in a similar fashion: The store worker had a gun placed to her head by men who forced her into the shop’s bathroom around 6 p.m. The robbers then took the woman’s backpack, cash, and at least two cell phones. They ran out of the store as a customer walked in, according to a police report.